Faithful Changes Counseling came to be out of an increasing awareness of the very real need of people struggling through life’s circumstances. In these times in our lives we are longing for good and lasting change. Faithful changes can be made in your life that will last a lifetime. 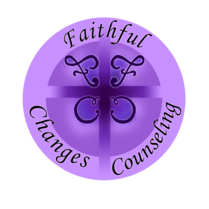 The mission of Faithful Changes Counseling is to help clients find new ways of journeying through their life circumstances. New ways that draw upon scientifically and spiritually sound therapeutic methods. My job is to help you be your own best helper by relying on – a true understanding of who you are and what you are responsible for; new skills and information; and a trust that you are not on this journey alone. To make faithful changes in your life requires ALL of who you are. With Faithful Changes Counseling your body, mind, and soul receive equal dignity and attention. Saint Paul teaches us that we can do all things through Christ who strengthens us, yet it is nice to have someone share in our troubles. It is okay to ask someone to help you with whatever you are working through. I’m here to help.